A piece from my NaNoWriMo novel. Trainer Fugol raised her brow, but didn’t comment. Clir glared at the young besra sitting on her forearm. 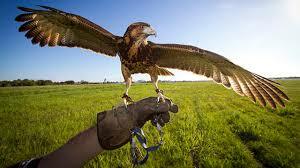 Clir tossed her arm abruptly, launching the raptor into the air with a tingling of bells. It screeched once, then flapped away toward the giant of a tree at the far end of the practice yard, the creance trailing behind it, though Clir was tempted to let it go and lose the bird altogether. “And what, do tell, does that have to do with anything?” Clir said with a smile that did not match the acid in her voice. Clir cursed again, and turned her glaring eye to the forest and then to the stables where the sound and smell of horses drifted even here, onto the birding-field. Clir turned away from her trainer and crossed her arms over her chest, holding in the fury that threatened to explode. It wasn’t Fugol’s fault she was stuck handling besra and hawks. Her father was no bird-master; he knew nothing of raptors or their particular powers and uses. All he saw was a daughter who disliked his beloved horses, and spent more time in the training-field than with her female cousins who showed a more appropriate interest in music and dance, than feathers and hoods. When she’d spent more than an hour with the young besra, she thanked her teacher and wandered back to the birding mews, pulling the stiff gauntlet from her hand. She hung her equipment and washed before strolling down the path that separated the housing for the male birds from the females’ cages. Toward the end, she stopped in front of a large cage, bigger than some of the stables for her father’s beloved horses. On a great broken branch stood an eagle, her curving beak glinting as though it had been oiled. Clir sighed, and leaned against the rail, letting her black tangle of hair fall across her eyes, obscuring the sight of the glorious raptor. One day, she would feel the weight and power of that massive creature, holding its jesses in her gauntlet. She’d remove the bewits–no need to put bells on a bird like that–then launch it into the open sky to watch it float and glide, defying the mundane laws that kept her tied to the earth. Wow! This month is really productive for you! Ain’t nobody don’t love a falconer or whatever the heck she’s called in that world. You go, Gurl!